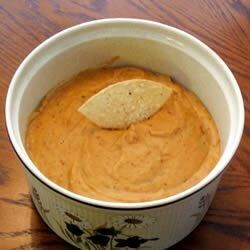 "This warm bean dip goes fast! Guests can't figure out what's in it and just can't get enough of it. Serve with tortilla chips." In a small saucepan, combine beans, cheese, ranch dressing mix, and sour cream. Heat the mixture over a medium heat, stir until the ingredients are well blended and warm. Simple, elegant appetizer in an instant! This is the most awesome dip I have ever eaten! I must admit that it doesn't look so appetizing, but if you get your guests to try just one bite, they're hooked! Thanks for the recipe! This recipe was great!! It is fast and easy and is even better with chopped geen onions and green chillies!!!! Used 1/2 buttermilk ranch, added a little more cheese and red food coloring to brighten the color. Awesome dip. I really liked this, it was great.